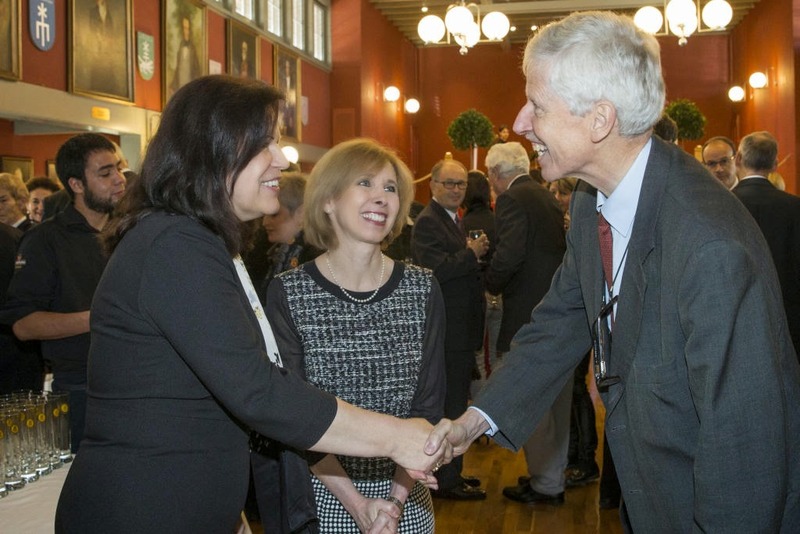 Professor of Economic of the University of Chicago Deirdre McCloskey was awarded the Hayek Lifetime Achievement Award in Vienna on the day before yesterday. 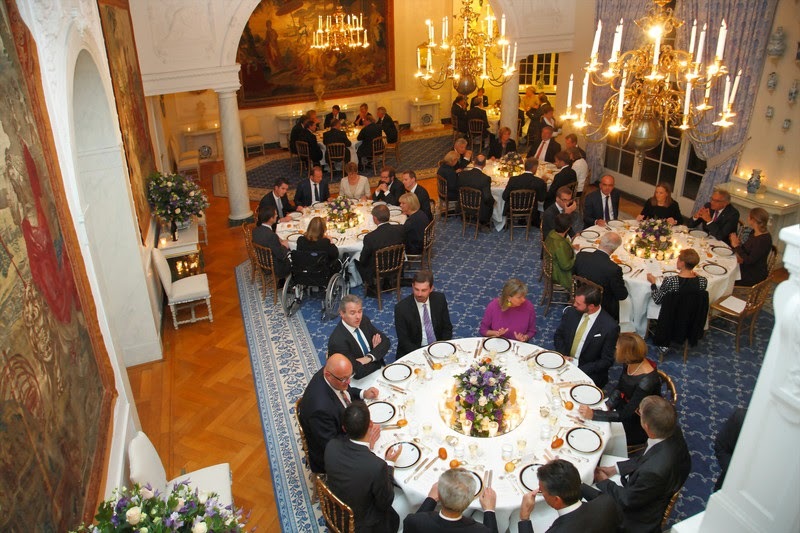 The gala event, which took place at the Gartenpalais Liechtenstein, was also attended by Prince Philipp who actually handed the award to economics expert. During the same event, an award for a school competition called "Next Generation's Mobility" was also given out. 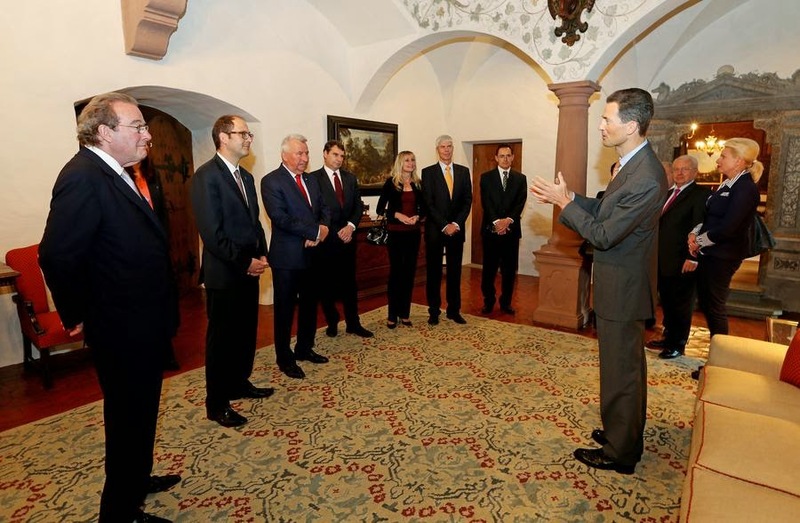 Today, Hereditary Prince Alois received four ambassadors in Vaduz, for the presentation of credentials. The received ambassadors were as follows: Elschekova Matisova from the Slovak Republic, Gholamali Khoshroo from the Republic of Iran, Per Poulsen-Hansen from Kingdom of Denmark, and Magnus Hartog-Holm from Kingdom of Sweden. No official photos have been released yet. Check back for them, in case they’re made available. A few gentlemen of the Grand Ducal Family made the movie premiere of the documentary Jean, Grand-Duc vu Lëtzebuerg a boys' night out: Grand Duke Henri and his oldest son, Hereditary Grand Duke Guillaume, as well as Prince Guillaume and his oldest son, Prince Paul-Louis, watched the documentary about their father and grandfather's life and work at the Ciné Starlight in Dudelange. 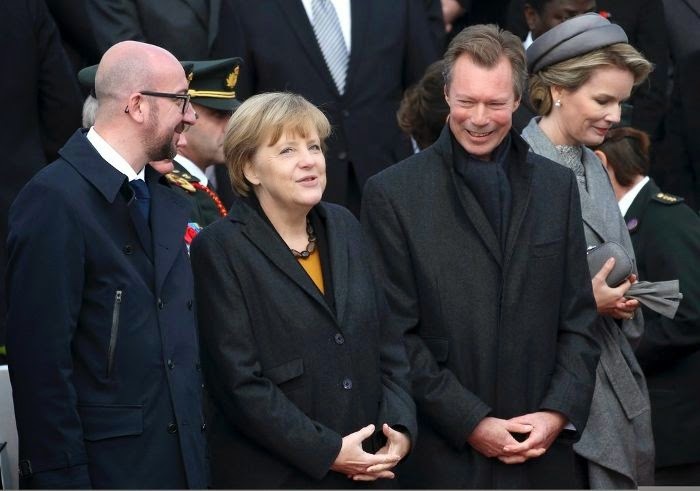 For some reason this article by Wort claims that Grand Duchess Maria-Teresa and Hereditary Grand Duchess Stéphanie were also in attendance but as they are not pictured at all, I have my doubts. The documentary about Grand Duke Jean will also be shown on TV on November 2 by RTL; the first part starts at 6:30pm and the second at 8:15pm. 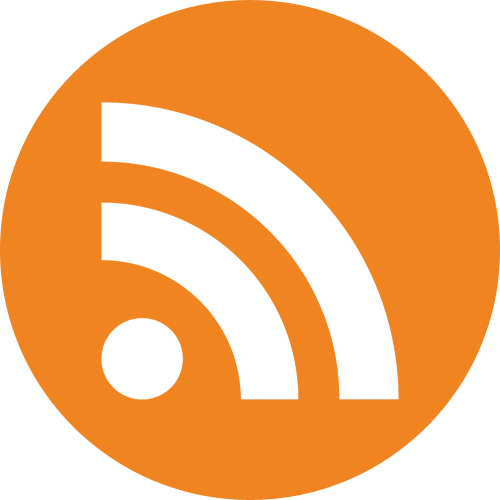 Of course we will post links if and when they become available. RTL offers a look behind the scenes of the documentary in this video. More pictures of the movie premiere as well as lots of lovely pictures from the documentary itself can be found at Wort. On Tuesday, Prince Nikolaus delivered the welcome address at the Liechtenstein Islamic Finance Conference. The title of the all-day conference was “Islamic Finance and Sustainability: A new Business Model for Financial Centres?” The overall focus was to explore how traditional Islamic banking and finance can benefit Liechtenstein, and vice versa. 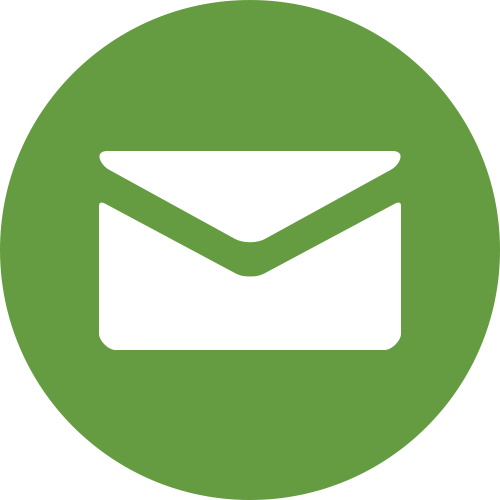 The larger goal was to consider how to make current banking in Liechtenstein compliant with Islamic traditions, in order to create an environment conducive to new banking opportunities. Besides Prince Nikolaus, other speakers included experts in Sharia-compliant financial intermediation from universities and financial organizations. No photos of the event have been released, but they will be added if any are. Today, Grand Duke Henri was in Belgium to commemorate the 100th anniversary of the First Battle of Ypres during World War I. The Grand Duke began the day in Brussels at the Musée Royal de l'Armée, which has hosted the exhibit 14-18, c’est notre Histoire since February of 2014. Then at 3:00, Grand Duke Henri attended a ceremony at the King Albert I Monument in Nieuwpoort. Also present were King Philippe and Queen Mathilde, as well as Princess Beatrix of the Netherlands. The event began with a speech from King Philippe and continued with testimonials from the war, a short film, a wreath-laying ceremony, and a moment of silence. At 5:30, the participants attended another event at Ypres, during which the Prime Minister of Belgium spoke. This ceremony also included wartime testimonies and a commemorative wreath-laying. More details about the 100th anniversary event can be found at www.be14-18.be. More photos can be found at Wort, Getty Images and Belga Image. Monaco's Minister of Foreign Affairs and Cooperation, José Badia, was on an official visit to Liechtenstein yesterday and the day before yesterday. 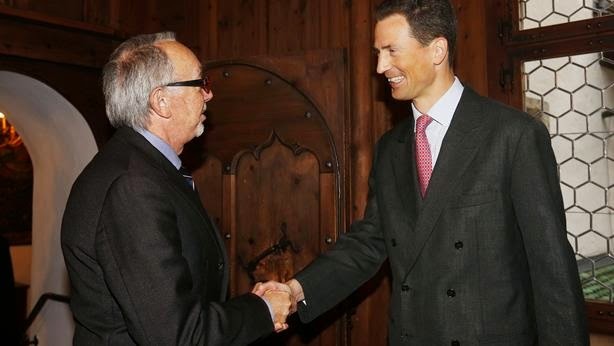 Apart from a meeting with his Liechtenstein counterpart, Aurelia Frick, to talk the European integration of both countries, he was also received by Hereditary Prince Alois for an audience. More at Volksblatt. 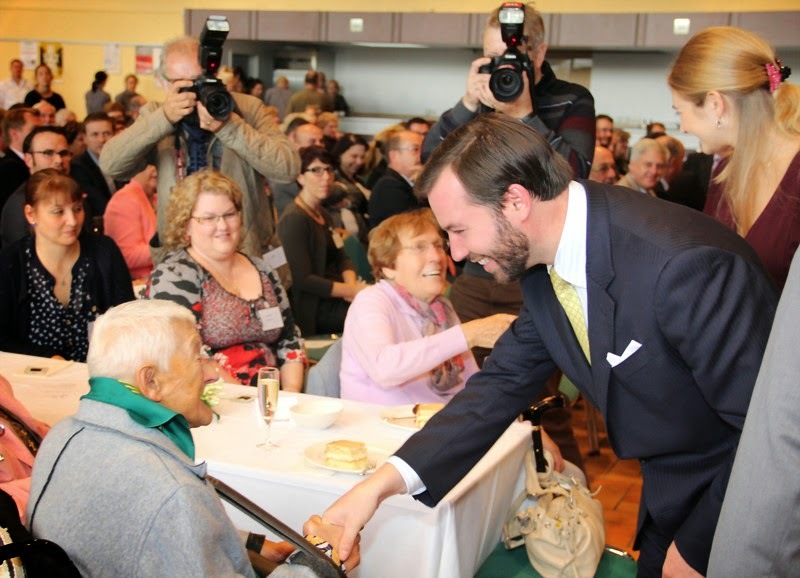 On Thursday, the Grand Duke attended a lecture to mark the 100th anniversary of the Lycee Technique Prive Emilie Metz. (Pictures here.) When the school opened on November 4, 1914 it was the first time that young students could receive an education that went beyond general academics. The school incorporated general education with technical training required for specific careers. The school has maintained an excellent reputation and continues to evolve. 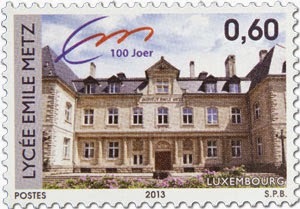 Last year the Post Luxembourg issued a stamp to commemorate the 100th anniversary of the school. 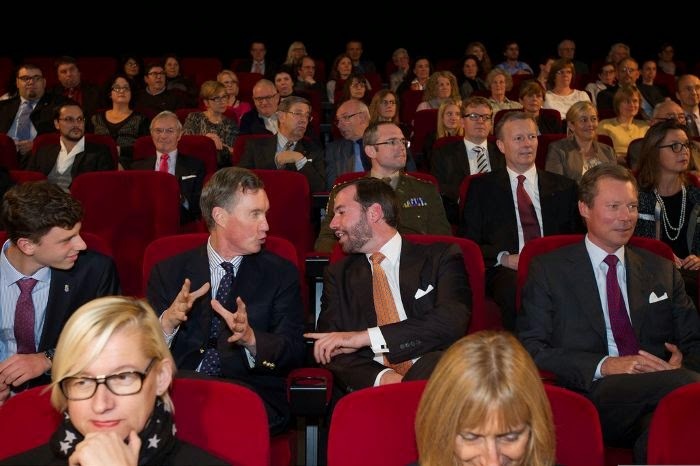 On Friday, the Grand Duke attended another lecture. This lecture marked the 20th anniversary of the Syndicat Intercommunal de Dépollution des Eaux Résiduaires du Nord. Pictures of it can be found at Lëtzebuerger Journal as well. Also on Thursday, Grand Duke Henri bid farewell to the outgoing ambassadors of Cuba and Cape Verde during audiences at the palais. Birthday boy Prince Nikolaus, who turned 67 today, celebrated his big day today with a celebration for his family's ancestral home country, Austria. Austrians celebrate their country's declaration of permanent neutrality after World War II and its regained status as an independent and sovereign nation - so basically its birthday as well - on October 26, 1955, on exactly that day every year. Two days in advance the Austrian ambassador to Liechtenstein, Maria Rotheiser-Scotti, and the Austrian honorary consul in Liechtenstein, Rita Kieber-Beck, hosted a reception in Vaduz to celebrate the Liechtenstein-Austrian friendship. Galleries of visuals of the event are located at Volksblatt and Vaterland. 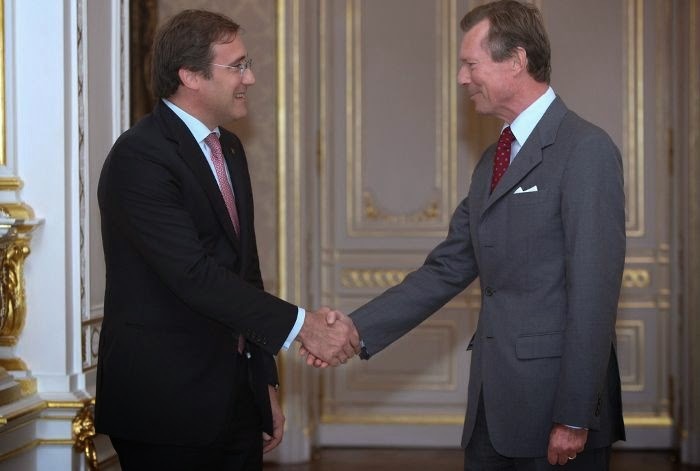 Grand Duke Henri received the Prime Minister of Portugal in audience today. 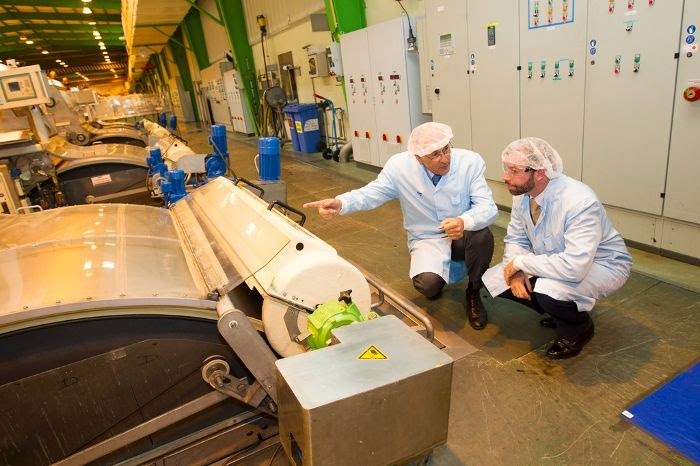 The visit is part of Prime Minister Pedro Passos Coelho's two day working visit to Luxembourg. Prime Minister Coelho will meet with many Luxembourgish politicians discussing matters ranging from education to emigration. Portugal and Luxembourg have a special relationship because more than 16 percent of the population are of Portuguese origin. The Grand Duke is himself descended from King Miguel I of Portugal no less than 3 times! 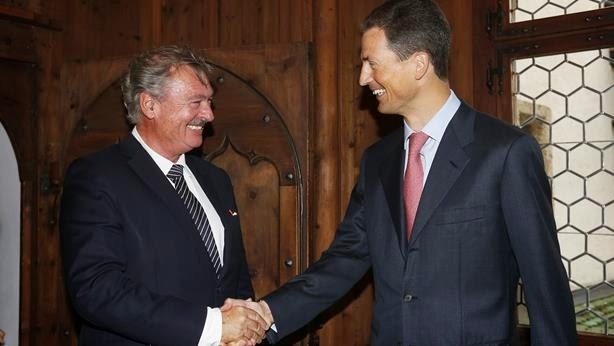 Another photo of the Prime Minister and the Grand Duke shaking hands can be found at the website of the Cour. More pictures can be found at Wort. At what point a new(-ish) princess does her first solo engagement without her hubby, mother-in-law or some other family member by her side always is of quite an interest for many royal watchers. Well, now the wait in Luxembourg's case is over: Probably a little lost in all the trade mission news during the week before last, Hereditary Grand Duchess Stéphanie had her first solo engagement when she visited the Uchihara luxury jewellery store in Tokyo to view and promote their section of Schroeder jewellery. Schroeder Joalliers was established in 1877 by Lambert Schroeder, who had left Luxembourg during the second half of the 19th century and settled in Chicago where he did an apprenticeship but returned to his home country after the Great Chicago Fire of 1871. While run by the second generation of the family, the jeweller became a purveyor to the Grand Ducal Court in 1920 and remains so to this day. Though they are probably most famous for their watches (which I bet many of the male members of the Grand Ducal Family wear), Schroeder has also created and adjusted jewellery for at least three generations of grand ducal ladies including Grand Duchess Charlotte, Grand Duchess Joséphine-Charlotte and Grand Duchess Maria-Teresa over the past almost 100 years. For example, they revised the Emerald Art Deco Tiara by Chaumet in recent years prior to a state visit by the sovereign couple. In addition, they also manufacture orders such as five or six crosses and badges of the Order of the Oak Crown each year. 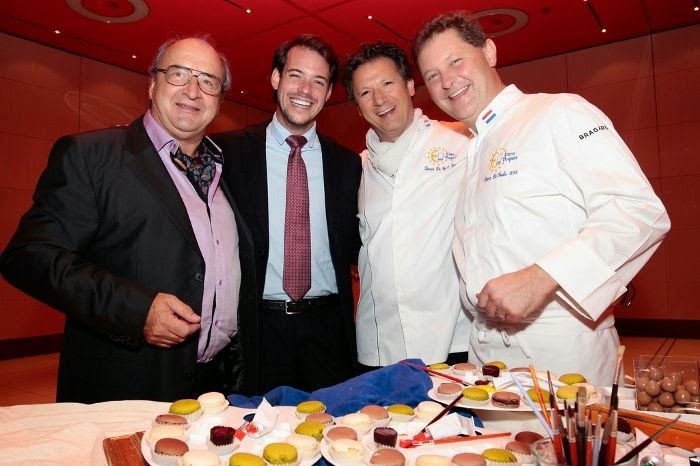 Now run by the fifth generation of the Schroeder family, Pierre Rossy, and the sixth generation, his daughters Sophie and Anni, also working for the company, Schroeder Joalliers also has a workshop in Paris in addition to its headquarters in Luxembourg's Grand-Rue. 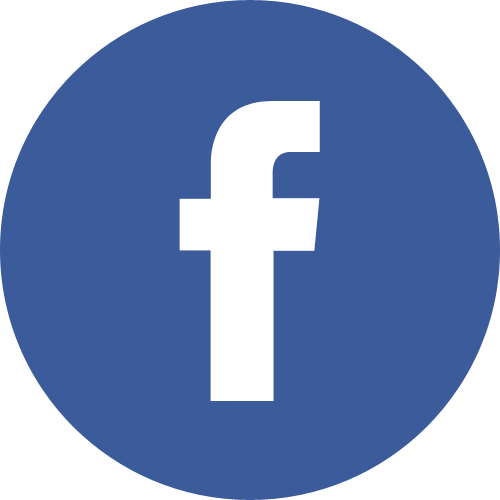 The company has expanded heavily during the past few years. Pieces by Schroeder are now also being sold in China, Japan, Russia and the Arab world in addition to several European countries. Doing her first solo engagement shortly before her second wedding anniversary places Hereditary Grand Duchess Stéphanie pretty much right in the middle of the time it took the European heirs' and newly married rulers' wives of the last decade and a half to firstly venture out of their palaces and castles on their own. The quickest of all of them was Princess Charlène of Monaco who did her first solo engagement a week after her wedding while still on her honeymoon. Together with her husband she was in South Africa, where Prince Albert attended an IOC meeting, when she flew alone to Noordhoek, Cape Town, and participated in a press conference with Archbishop Desmond Tutu to discuss the charity "The Giving Organisation" (of which they are both co-patrons) five days after her wedding. Also pretty quick off the blocks were Crown Princess Mary of Denmark, who did her first solo engagement on June 14th, 2004, exactly one month after her wedding when she attended the National Pony Championships in Jutland, as well as the the Duchess of Cornwall, who visited the Southampton General Hospital on May 23, 2005, while her wedding to the Prince of Wales took place on April 9. In difference, it took the Duchess of Cambridge about half a year before attending her first solo engagement while standing in for her father-in-law who was at a funeral in Saudi Arabia. On October 26, 2011, the Duchess hosted a charity cocktail reception for "In Kind Direct", a patronage of the Prince of Wales, at Clarence House. She was famously married on April 29, 2011. Queen Máxima of the Netherlands' (at the time still Princess Máxima) first solo appearance, a visit to the Meuse County Hospital in the province of Sittard, occured on August 16, 2003, around 18 months after her (02/02/2002) wedding to the then Prince of Orange. Following the Hereditary Grand Duchess in the ranking is Queen Letizia of Spain. The then Princess of Asturias made her first appearance sans her husband, mother-in-law or any other family member accompanying her on October 9, 2006, about two and a half years after her wedding, which took place on May 22, 2004. For her first solo engagement Queen Letizia visited the Pozuela de Alarcon School. Of the woman marrying the rulers, heirs or heir's heirs of Europe within the last one and a half decades, it took Crown Princess Mette-Marit of Norway the longest time to do her first solo engagement. She married the Crown Prince on August 25, 2001, and did her first solo engagement in January 2005 when visiting Malawi on a charity trip about three and a half years after tieing the knot. A quick note to end this post: I probably do not need to tell you that we do not take responsibility for the correctness of all the dates mentioned above. Of course we used the utmost care to locate all the correct dates for the first solo engagements of the ladies mentioned above, however, it is entirely possible that one them slipped through our hands. 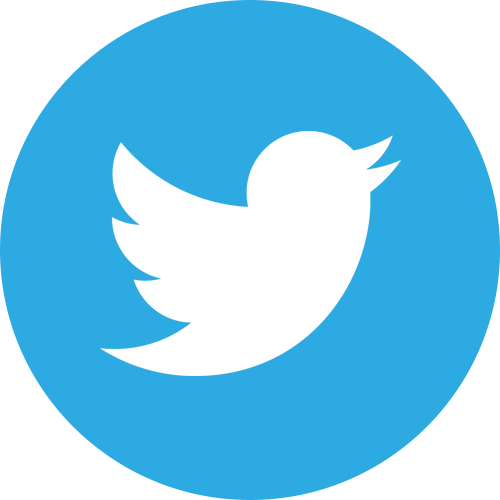 All the information was gathered from painstaking research all over the internet. 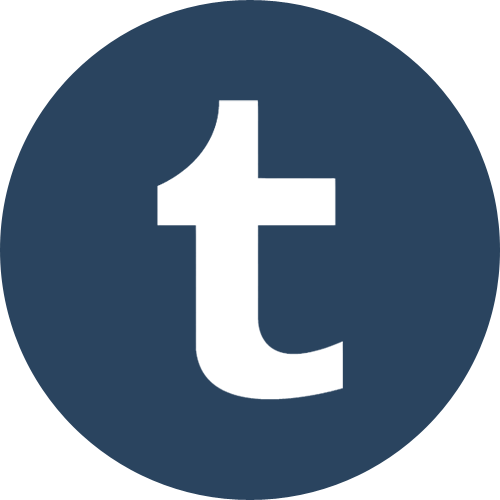 A very special and huge thank you in this regard goes to Lea, who did the great majority of research going into this post! 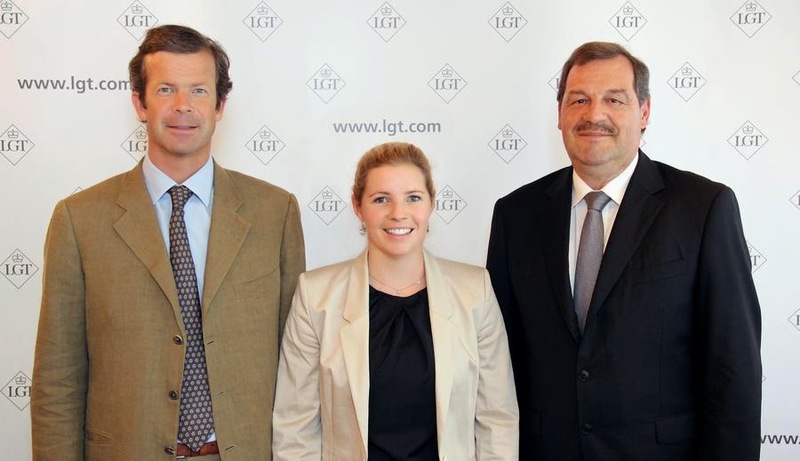 It was announced today that the LGT Group will continue to be the main sponsor of the Liechtenstein Skiing Association LSV as well as their current biggest star, Tina Weirather, for the coming next two years. New contracts with Weirather and the LSV president Andreas Wenzel, who is both a two-time Olympic medalist and world champion as well as Weirather's uncle, were already signed last month. In a statement issued today Prince Max was quoted as saying, "Ski sport has always played a major role in our sponsoring strategies. As one of Liechtenstein's biggest companies it is our aim to support sportive further development of our country and skiing offers perfect possibilites to do this." Pictures and what else Prince Max said can be found both at Vaterland and Volksblatt. Today, Prince Félix and his yellow trousers met with representatives of the Organisation Professionelle des Vignerons Indépendants (OPVI) of the Luxembourg Moselle region. 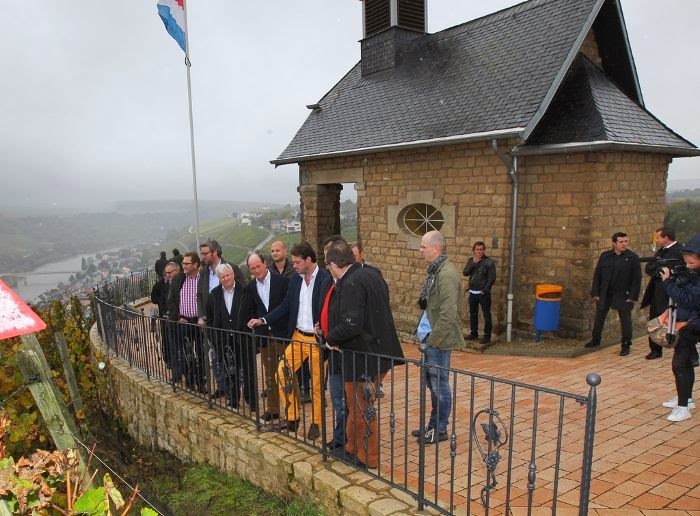 The second son of Grand Duke Henri and manager of a wine estate himself was accompanied on his visit to the Domaine Schumacher-Lethal et fils in Wormeldange by the Minister of Agriculture, Fernand Etgen. 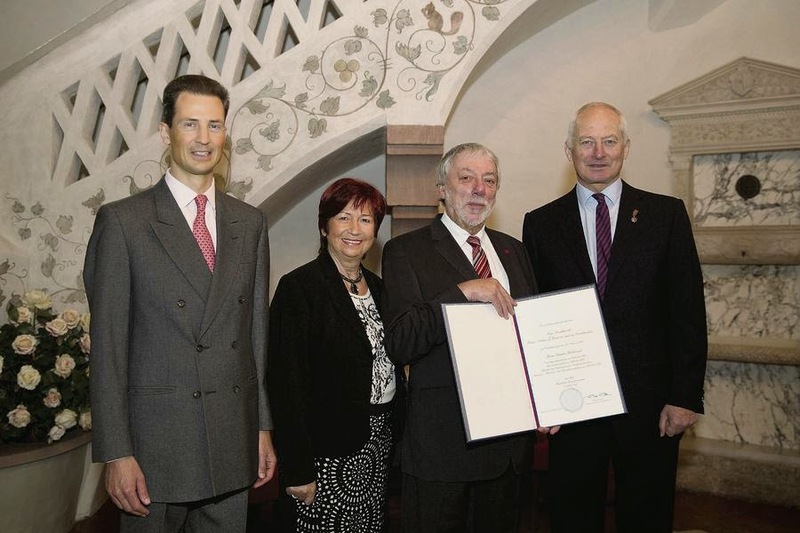 During his visit Prince Félix was given the honorary title of ambassador of wines and crémants by the independent winemaker association. Wort in English has more pictures of the visit, as does Wort in German. 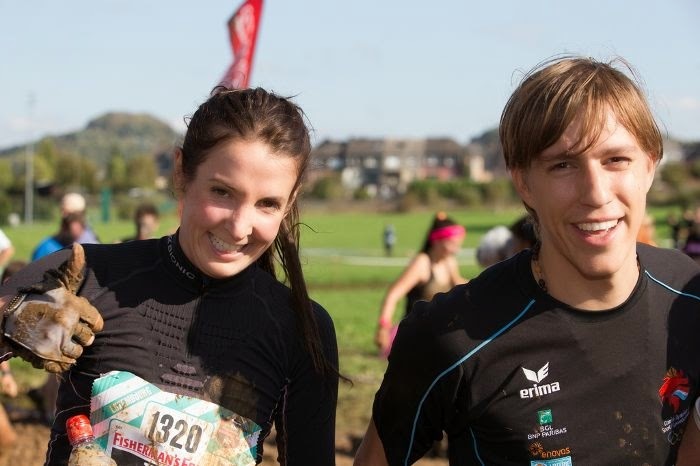 Yesterday, Prince Louis and Princess Tessy took part in the StrongmanRun, a long distance obstale race. So how exactly did the King Prince and Queen Princess of Mud stack up against the rest of the field? Yours truly found out: Louis Nassau came in place 1232 in a time of 03:15:06 in the men's division consisting of 1,809 runners, while Tessy de Nassau was 157th of 423 women in a time of 03:15:07, a second behind her hubby. Even though I have no idea how that stacks up in the grand scheme of the world's StrongmanRunners, all kudos to them for participating in (and finishing) the race! Both their efforts raised money for Veterans Aid. Prince Félix and Princess Claire were in Germany last Saturday - don't ask me exactly how he did it cause I thought he was at the tennis final though maybe I have my days mixed up - where they planted a tree, a sycamore maple to be more specific, in Usingen, the town where Princess Claire spent most of her childhood. It is a tradition in the Hessian town (which coincidentally also lies in the former Duchy of Nassau) that all newly weds of the previous year gather to plant sycamore trees in the so-called "wedding forest". This is part 2 of my memories of the wedding of the Hereditary Grand Ducal Couple, two years ago now. In the first part you could read about my experiences at the day of the civil wedding, which included, for me, a handshake with the couple and a magnificent view of Europe's royals in all their finery arriving at the Palais Grand Ducal for the gala dinner. In this piece I'll write about the day of the religious wedding! Beforehand I thought this would be the real big day, but after day one, I thought that nothing could top that day! After a night's rest and early breakfast at my hotel, I packed my bags (no problem, I travel light), checked out and walked the short distance to the Cathédrale Notre-Dame. After noticing the day before that spectators seemed to turn up last minute, I figured that being at the cathedral around 8am would be early enough. I was right, although I must say that this time around, there already were quite a number of people waiting. I found myself a very nice spot, near the beginning of the red carpet. Not bad, right? And then, the waiting game! It was three hours before the ceremony would start, but quite some time before that the guests would arrive, so the waiting actually wouldn't be that long. Meanwhile, I talked to some people (many Dutch and Flemish people) and enjoyed the sun because the weather was extraordinarily beautiful for October. I could also watch the press arrive and the guard of honour got lined up as well. Some green mini busses arrived from time to time with the first guests though I didn't recognize any of the people getting off. It was still quite early, most royal guests would arrive a lot later. I got a bit worried though, many of those buses stopped exactly in front of me, so they blocked my sight for a big part. These buses are killers for royalty watchers! I really hoped that this wouldn't be the case when the more prominent guests would arrive. I saw some Habsburgs arrive - Archduchess Marie-Astrid's kids, for example - but they walked by very quickly. As I couldn't take a decent picture of them while walking by so fast, I didn't bother. Then a huge bus stopped: indeed, exactly in front of me! I did have a good view of Crown Prince Alexander II and Crown Princess Katherine of Yugoslavia though. The next few minutes were very frustrating: Guests were leaving the bus, I heard the press and people getting more excited but I could not see a thing! I figured that the bus must have contained many members of the non-reigning families, like the Badens, the Vendômes and the Prince of Prussia among others. Bummer. I really wanted to see some of them as I had never cought a glimpse of them before. When the bus drove away, I could only see Crown Prince Alexander and Crown Princess Katherine walking the red carpet as well as some of the Bulgarian royals, the Prince of Preslav and his sister-in-law the Princess of Turnovo. The Yugoslavian couple always seems to enjoy attending European royal events and this time was no exception, they waved enthusiastically to the people and didn't hurry down that red carpet! You will notice that my pictures are not of the highest quality. As I wrote earlier: I only have a simple camera but when I'm zooming in, it can take pretty good pictures. I didn't zoom in though as it takes time and everything goes by so quickly. So I simply hold the camera over my head, click many times and in the meantime I can take it all in myself, with my own eyes. For top quality pictures I can buy magazines or search for pictures on the internet, but really getting into the moment and the excitement is more important to me. And as you can see, you still get pretty nice pictures in the end. But back to what was going on: More mini busses! This time, however, I was lucky, they didn't completely block my view. I saw Prince Carl Philip of Sweden, Princess Märtha Louise of Norway, Archduke Lorenz and Archduchess Astrid (Princess of Belgium) of Austria-Este, their son Archduke Amedeo and Prince Laurent and Princess Claire of Belgium arrive. Archduke Carl Christian of Austria with his wife Marie-Astrid, born Princess of Luxembourg. Prince Nikolaus of Liechtenstein with Princess Margaretha, born Princess of Luxembourg. To the left, Prince Jean of Luxembourg and his wife Countess Diane of Nassau. It was nice to experience that the excitement was growing. The next mini bus contained the European heirs to the throne, plus the Japanese Crown Prince. Their arrival caused quite a sensation for both public and press. I saw: Crown Princess Victoria and Prince Daniel of Sweden, Crown Prince Frederik and Crown Princess Mary of Denmark, Crown Prince Haakon and Crown Princess Mette-Marit of Norway, the Prince of Orange and Princess Máxima of the Netherlands, Prince Philippe and Princess Mathilde of Belgium, the Prince and Princess of Asturias and Crown Prince Naruhito of Japan. The three heirs to the Scandinavian thrones and their spouses in one picture. The heirs the the Spanish, Belgian and Dutch thrones and their wives - two years laters and they are all kings and queens now. After all the cheers and excitement of the arrival of the heirs to the throne, a long string of escorted cars began to arrive. I was a bit surprised that Crown Princess Margarita and Prince Radu of Romania stepped out of the first car. Why weren't they in the big bus with the Yugoslavians, Bulgarians and all the other members of non-reigning families? They aren't former reigning sovereigns either... Well, those are thoughts for royal die hards only I guess! Caroline, Princess of Hanover, Hereditary Princess of Monaco. Well known over the whole world, she was greeted very loudly. Prince El Hassan bin Talal and Princess Sarvath of Jordan. They walked by very quickly. The Earl and Countess of Wessex, the usual representants of the British Queen at continental European royal weddings. The Hereditary Grand Duke's brothers and sister-in-law: Prince Félix, Prince Louis, Princess Tessy and Prince Sébastien. King Simeon II and Queen Margarita of the Bulgarians. They hardly ever miss a royal event: King Constantine II and Queen Anne-Marie of the Hellenes. Princess Lalla Salma, wife of the King of Morocco. The first of the reigning sovereigns to arrive: Prince Hans Adam II of Liechtenstein with Princess Marie. The crowds gave Queen Silvia of Sweden a warm welcome. The groom's great uncle and great aunt: King Albert II and Queen Paola of the Belgians. King Harald V and Queen Sonja of Norway who are rather close family as well: King Harald is a first cousin of the late Grand Duchess Joséphine-Charlotte. Greeted with loud cheers: Queen Beatrix of the Netherlands. Then the hightest ranking guest arrived: Queen Margrethe II of Denmark with Prince Henrik. All the royal guests had arrived! It was fantastic to see them all go by. Next to arrive: Grand Duke Henri with Mrs. De Schaetzen, aunt of Princess Stéphanie and sister of Stéphanie's mother, who, as we know, had passed away two months before. Then the day's groom arrived together with his mother Grand Duchess Maria Teresa and the crowds went wild! The big moment was there: the arrival of Princess Stéphanie! The bride was being escorted by her eldest brother, Count Jehan de Lannoy. That was quite a royal experience! But what next? Waiting the entire service at the same spot to watch everyone leave the cathedral? Or going to the Palais for the balcony scene? But maybe I couldn't get there anymore? Maybe the limited space before the balcony was already packed with people? If that was the case, I would better stay where I was... Quite a dilemma! In the end, I left, hoped for the best and went to the Palais. When I arrived I saw that there were very few people! I could have known it, judged by the day before. Great! I walked a little more: no need to stay near the Palais as it would be no problem to see the balcony scene. I went to the Knuedler where the wedding service was being broadcasted on a big screen. As you can see on the picture: there were people, but it was not very crowded. The contrast with the London wedding a year earlier couldn't be bigger. But let's be honest: you can't really compare. The most important thing was that the atmosphere which was great. After buying something to drink I decided to wait until the balcony scene would begin. It didn't get crowded until almost the last minute (is this a Luxembourgish thing or something?). While waiting and looking at the Palais, I spotted a little boy behind one of the top windows (according to the Luxarazzi ladies it's one of the little Counts de Lannoy). The service lasted longer than planned, so the balcony scene started later as well. I heard cheers from people right in front of the Palais: I was a little more in the back so I couldn't see, but it was a sign that the couple had arrived and that it wouldn't take long before they would make their appearance on the balcony. And after some more waiting, Hereditary Grand Duke Guillaume and the brand new Hereditary Grand Duchess Stéphanie finally appeared on the balcony. Now I had the opportunity to take my time to zoom in with my camera and make some close ups. I'm happy with the results! And then, according to the relatively new royal 'tradition' started at the 1981 wedding of the Prince and Princess of Wales: the kiss! Then the groom's parents, brothers, sister and sister-in-law also appeared. After the balcony scene was over, I rushed to the train station to catch the train I had planned to catch. Early that evening, I was home! It had been two amazing days in the beautiful city of Luxembourg. This was an lovely royal occasion: it was a grand affair with a galaxy of royalty attending, but at the same time with all the benefits of taking place in a relatively small city, which made everything very accessible and relaxed. Moreover: the Nassaus are not the Windsors, so this wedding wasn't quite the media spectacle as the wedding of the Duke and Duchess of Cambridge, which was a very good thing. I hope you enjoyed reading my pieces. Thanks to the ladies at Luxarazzi for inviting my to write these two pieces about the wedding, it was my pleasure!